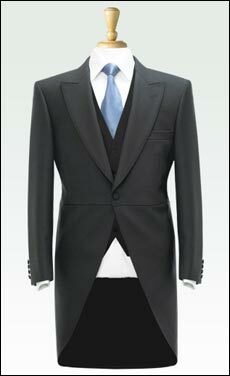 Our mix-to-fit sizes allows the flexibility to have any size jacket with any size waistcoat and any size trouser. Jacket: 70% polyester 30% wool. Two button single breasted plain black Masonic jacket with side vents. Three inside pockets, one with button fastening, and one pen pocket. Three button cuff. Machine washable. Matching Waistcoat: 70% polyester 30%wool. Five button waistcoat with two outside welt pockets. Machine washable. Masonic Striped Trousers: 70% polyester 30% wool. Black/grey half lined Single pleat striped trousers with slant side pockets and one button fastening hip pocket. With belt loops Machine washable. Matching plain black trousers are available, see individual items below, to give the option to make a classic plain black lounge suit. Trouser waist sizes: 32" to 50"
Matching plain black trousers in the same style as the Masonic striped trousers to give the option to make a classic plain black lounge suit. Jacket: 100% pure wool black herringbone two button single breasted jacket with side vents. Three inside pockets, three button cuff. Dry clean. Matching Waistcoat: 100% wool Five button waistcoat with two outside welt pockets. Back straps and buckle for adjustment. Dry clean. Masonic Striped Trousers: 55% polyester 45% wool. Black/grey half lined Single pleat or Plain front trousers with slant side pockets and two button fastening hip pockets. With side adjusters. Dry clean. 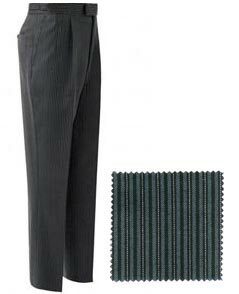 Single pleat black/grey striped trousers waist sizes: 28" to 52"
Brook Taverner have years of experience in producing tailored garments so the exceptional quality of their Masonic clothing is guaranteed. Jacket: 55% polyester 45% worsted two button single breasted plain black Masonic Jacket with side vents. Four inside pockets, three button cuff. 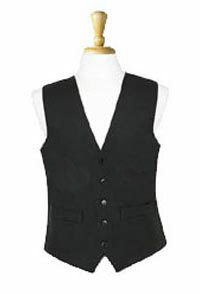 Matching Waistcoat: Five button waistcoat with four outside welt pockets. Back straps and buckle for adjustment. Tailored from high quality Sunningdale fabric. Dry clean. 55% polyester 45% Masonic black/grey half lined striped trousers with slant side pockets and one hip pocket. Single pleat with belt loops. Machine washable. Masonic Striped Trousers: 55% polyester 45% Masonic black/grey half lined striped trousers with slant side pockets and one hip pocket. Single pleat with belt loops. Machine washable. Jacket chest Sizes: 38" - 54"
Waistcoat chest Sizes: 38" - 54"
Waist sizes: 32" to 52"
BROOK TAVERNER PLAIN BLACK MASONIC JACKET: 55% Polyester 45% worsted single breasted black jacket with side vents, four inside pockets. Three button cuff. Tailored from high quality Sunningdale fabric.Dry clean. BROOK TAVERNER PLAIN BLACK MASONIC WAISTCOAT: 55% Polyester 45% worsted single breasted five button waistcoat with four outside welt pockets. Back straps and buckle for adjustment. Tailored from high quality Sunningdale fabric. Dry clean. BROOK TAVERNER MASONIC STRIPED TROUSERS: 55% polyester 45% wool black/grey half lined masonic striped trousers with slant side pockets and one hip pocket. Single pleat with belt loops. Machine washable. Also available in black single pleat half lined trouser with belt loops to match the jacket and waistcoat to make a plain black 3 piece suit. 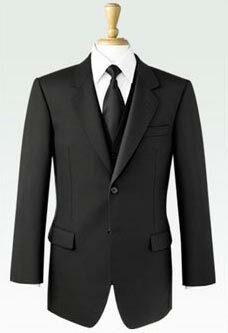 55% polyester 45% wool plain black half lined trousers with slant side pockets and one hip pocket. Single pleat with belt loops. Machine washable. Jacket: 100% Wool single breasted two button black Masonic jacket with side vents. Four inside pockets. Three button cuff. Dry clean. Matching Waistcoat: 100% pure wool single breasted five button waistcoat with four welt pockets. Back strap and buckle for adjustment. Dry clean. Masonic Striped Trousers: 55% polyester 45% wool black/grey half lined masonic striped trousers with slant side pockets and one hip pocket. Single pleat with belt loops. Machine washable. Jacket chest Sizes 38" - 50"
Waistcoat Chest Sizes 38" to 56"
BROOK TAVERNER HERRINGBONE BLACK MASONIC JACKET: 100% Wool single breasted two button black Masonic jacket with side vents. Four inside pockets.Three button cuff. Dry clean. Chest Sizes 38" to 50"
BROOK TAVERNER HERRINGBONE BLACK MASONIC WAISTCOAT: 100% pure wool single breasted five button waistcoat with four welt pockets.Back strap and buckle for adjustment.Dry clean. Chest Sizes 38" to 56"
100% pure new wool black subtle herringbone half lined masonic trousers with slant side pockets and one button fastening hip pocket. Single pleat with side buckle adjusters. Machine washable. Trouser waist sizes: 32" to 52"
BROOK TAVERNER PURE WOOL BLACK HERRINGBONE PATTERN TAILCOAT: 100% Pure new wool classic tailcoat. Single breasted one link button fastening with edge to edge centre vent. Two interior pockets. Four button cuff. Dry clean. Jacket: 100% wool two button single breasted classic black herringbone pattern Masonic Jacket with side vents.Two inside pockets. Four button cuff. Matching Waistcoat: 100% wool six button waistcoat. Two welt pockets. Full lining back. Masonic Striped Trousers: 45% wool 55% trevira. Half lined black/grey striped trouser with single pleat, side adjusters, two slant side pockets, one hip pocket with button fastening.